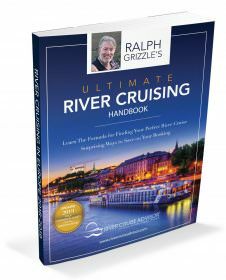 This is a continuation of a series featuring my favorite cruises of 2016, to be compiled in an ebook that will be published on January 31, 2017. I was on Crystal Mozart for fewer than 48 hours. Even so I quickly came to appreciate what Crystal Cruises, a leader in luxury blue-water cruising, was attempting to create on the Blue Danube. I should note that I had no choice but to make a quick study. Two nights on board, and I was to be booted off. I was part of a VIP group in Vienna for Crystal Mozart’s christening. After the bottle had broken against the hull, we were expected to start packing to make room for paying guests on Crystal Mozart’s inaugural voyage. To introduce Crystal Mozart, Crystal had to take “The Queen of Europe’s Rivers,” as the vessel is affectionately known, down to her steel structure and build her back up. It was no easy task, especially with the clock ticking toward the ship’s christening date in Vienna. And so it was that in July of 2016, Crystal River Cruises introduced a river cruiser that was as beautiful as it was innovative. It was a remarkable feat. In 2009, I sailed on Mozart when it operated for Peter Deilmann River Cruises. Touring Crystal Mozart in Vienna, I saw hardly any vestiges of the old vessel. Simply, Crystal Mozart was stunning and appeared to be a new ship. 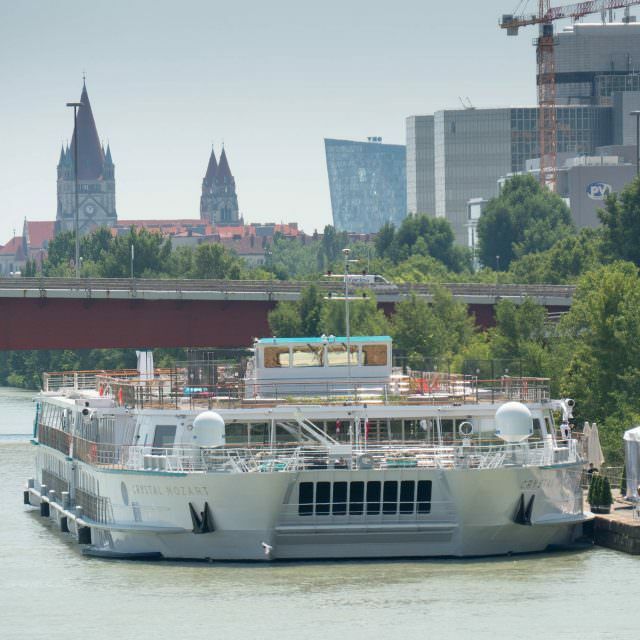 At 22.85 meters (75 feet) across, Crystal Mozart is nearly twice the width of the standard river cruiser. 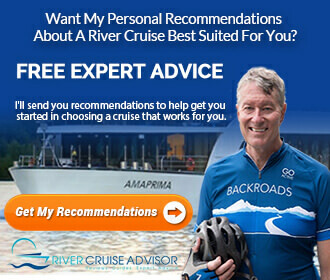 That extra width allows for a lot more in terms of public rooms and generally larger staterooms than you might find on the standard river cruiser. Staterooms, in fact, feature king-sized beds. The double width limits Crystal Mozart’s itineraries to the Danube. The extra width also gives those traveling on Crystal Mozart the feeling of being on a small luxury ocean-going vessel, a Crystal Cruises’ ocean-going vessel, in fact. Throughout Crystal Mozart elegant furnishings adorned public areas that would be familiar to those who have sailed Crystal Cruises’ two luxury ocean ships, Crystal Symphony and Serenity. Just as on those ships, on Crystal Mozart you’ll find the Bistro, the Cove and Palm Court, for example – as well as Crystal’s renowned staff. Staterooms and suites carried familiar amenities: Crystal bathrobes and kimonos, Etro toiletries and even Crystal-logo shopping and laundry bags similar to those that you will find on Crystal Symphony and Serenity. Complementing Crystal Mozart’s elegance are some innovative itineraries and shore programs. Crystal aimed to differentiate itself from the other major players in this region with what it offered ashore. For example, on Crystal Mozart guests can choose to dine ashore in one of nine Michelin-starred restaurants at no additional cost once during each cruise. Crystal Mozart is a beautiful vessel with unique attributes and activities, a good choice for those wanting the style and sophistication of Crystal Cruises, on the Blue Danube. Want To Experience Crystal Mozart On The Danube? In 2017, Crystal Mozart will offer 26 departures on the Danube with fares beginning at US$3,535 per person. The ten-night cruises, roundtrip Vienna, begin on April 2 and continue through December 23, perfect timing for the Christmas markets along the Danube.